The Nationalist Congress Party (NCP) on Wednesday hit back at Congress General Secretary Rahul Gandhi for holding coalition politics responsible for price rise, saying it was an injustice to blame Agriculture Minister Sharad Pawar alone for the issue. 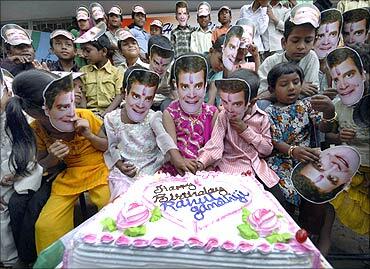 Image: Schoolchildren wearing masks of Rahul Gandhi. "I do not agree with his opinion....This is injustice to anyone because this is the responsibility of the entire government," NCP general secretary Tariq Anwar said. He was reacting to Rahul Gandhi's contention that price rise was the result of coalition politics, a remark construed as a reference to Pawar. Image: A supporter of the Congress party has Prime Minister Manmohan Singh's face painted. The Congress had earlier also made oblique attacks on Pawar for price rise. Anwar, a senior leader from Bihar, also reminded Congress of its poor show in the state where Rahul Gandhi had led the party campaign. "I think Congress should understand what is the ground reality. After the Bihar election, where does Congress stand, Congress should understand. This is coalition era and we cannot ignore coalition governments," he said. 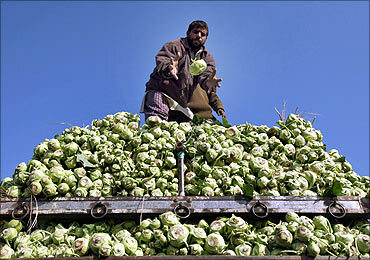 Image: A Kashmiri man loads cabbages onto a truck. His remarks came a day after Gandhi, during an interaction with students in Lucknow said, "It was a single party government then (during Indira Gandhi's prime ministership) while today it is a coalition and so has some compulsions". 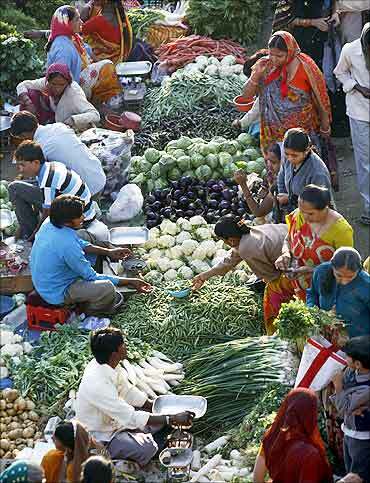 Image: People shop at an open air vegetable and fruit market in Ahmedabad. The AICC general secretary was asked as to why the UPA government was "not able to control inflation and corruption as his grandmother and late Prime Minister Indira Gandhi could do". 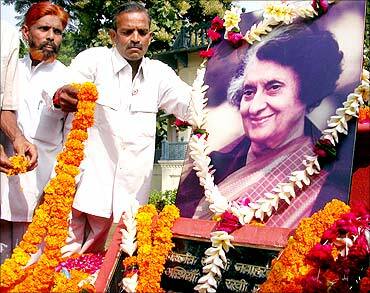 Image: Activists of the Congress party lay garlands before the portrait of former PM Indira Gandhi. The Bharatiya Janata Party (BJP) took dig at Rahul Gandhi on his remark that coalition politics was responsible for rising prices, saying even the NDA government under Atal Bihari Vajpayee was a coalition regime but prices were stable then. BJP spokesperson Nirmala Sitharaman described Rahul's statement on this "very sensitive, critical issue of prices" as one which has come due to lack of understanding. She said it was even more regrettable that this has come from "somebody who is being projected as a messiah of new leadership, youth leadership of the Congress party." "Congress came to power in the name of aam aadmi, who for the last two years has not heard anything other than prices will come down in the next six months and some astrological predictions about prices," she said. 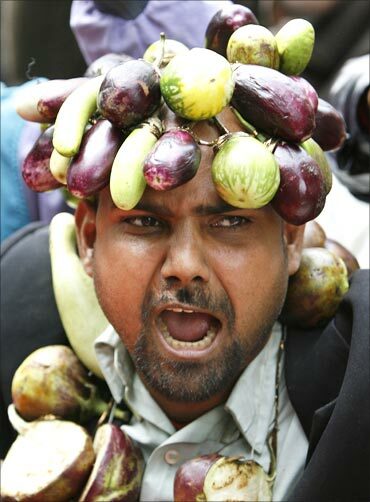 Image: An activist from India's main opposition Bharatiya Janata Party, wearing a garland of vegetables. The BJP leader said Congress has been telling people that it is the compulsion of coalition politics due to which government is not taking enough action to bring prices down. She claimed that in the erstwhile NDA rule, prices had remained stable even during periods of drought. "Let me remind here that even Vajpayee headed a coalition government with more than 20 political parties in it. And during that time prices were very much under control and the economy was vibrant," she said. During periods of droughts, grains were sent to the affected areas by the Centre which had also borne the costs involved. 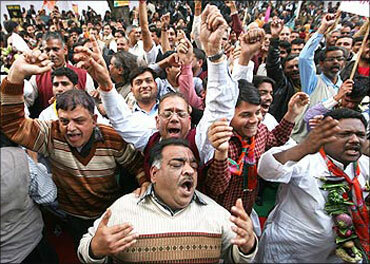 Image: People protest against price rise. The BJP insisted that in a coalition government political parties comprising it may have to make some compromises on their core issues or ideology but not on prices of commodities. "This just shows lack of understanding. What have prices got to do with this. There is a complete lack of leadership today," Sitharaman said. The principal opposition also pointed out that the government had given two ministries having conflict of interest to one person (Sharad Pawar). Sitharaman maintained that while the priority of the Agriculture Ministry was farmers' interest, the Ministry of Consumer Affairs, which she alleged is "probably in hibernation", wanted that the consumer got the best price. 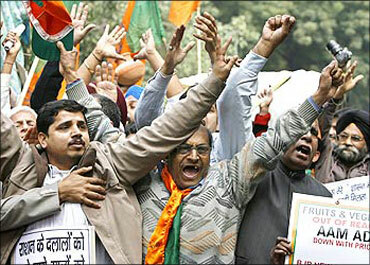 Image: Bharatiya Janata Party activists shout slogans against price rise.